"Sources report that the XF-R will get a new supercharged 5.0-liter V8 making a minimum of 500 horsepower, so Jaguar clearly appears to have the likes of the BMW M5 and AMG E63 in its sights." Yes, this pretty kitty positively oozes the feel of performance. Maybe it will help to overcome that rear end quarter panel that positively oozes the look of a Dodge Intrepid. Full spy report after the jump. Wait, Jim Dunne's still alive? Who knew? — Ed. 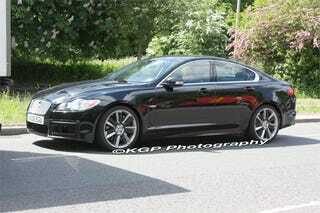 We caught our best shots yet of the Jaguar XF-R as it rolled through the city streets in the UK. Hood vents, a deeper, more aggressive front air dam, and a new mesh treatment to the grille coverings signify the hottest version of the XF. The XF's side vents are also blacked-out for a more sinister look. Large turnbine-style wheels (likely to be 20-inchers) are taped up a bit, but their aggressive design is clearly visible. Quad exhaust tips round out the visual changes. The XF-R's body mods are subtle, yet very pursposeful to set it apart from lesser XF models. Sources report that the XF-R will get a new supercharged 5.0-liter V8 making a minimum of 500 horsepower, so Jaguar clearly appears to have the likes of the BMW M5 and AMG E63 in its sights.